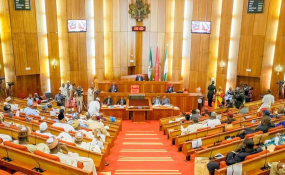 Nigerian senators on Wednesday rejected a bill aiming to phase out petrol vehicles and introduce electric cars in the country in 2035. The bill, first read on April 10, was not considered for a second reading by the lawmakers. In his lead debate, sponsor of the bill, Ben Murray-Bruce, said the move would serve two major purposes. "Combustion engine cars have continued to cause deaths through uncontrolled pollution," said Mr Murray-Bruce (PDP, Bayelsa East). "Secondly, we have been spending over N1 trillion annually subsidising fuel in this country. "By introducing electric cars, fuel subsidy will automatically be gone and those funds will be used for infrastructure and education," he argued. Mr Murray-Bruce told his colleagues that all industrialised nations have set a date to phase out petrol cars. He added that Nigeria would be setting good precedence if it takes the step to become the first African country to embrace electric cars. The senator said maintaining an electric car is far cheaper than for petrol cars. "To charge your electric cars, all the filling stations will be replaced with solar charging stations. Thankfully, this country is blessed with sunlight 365 days in a year. "Electric cars are outselling petrol cars as witnessed in Norway a few weeks ago. It makes more sense to build Nigeria's biggest power plant than refineries." The bill was opposed by Barau Jibrin who said Nigerians should be allowed to embrace electric cars at their economic pace rather than making it mandatory. "Making it mandatory that everyone should resort to using electric cars at a given day is not feasible," he said. Deputy Senate President, Ike Ekweremadu, and Andrew Uchendu also spoke against the bill. Mr Murray-Bruce said his colleagues are still living in the past for rejecting the bill. "I want my colleagues to close their eyes and dream they are in the 21st century. In a few years time, combustion engine cars will no longer be manufactured. For the sake of my colleagues, I'll withdraw the bill. You don't belong to the 21st century and I understand."